Hi all! A super quick post today, sharing the card I made this morning. 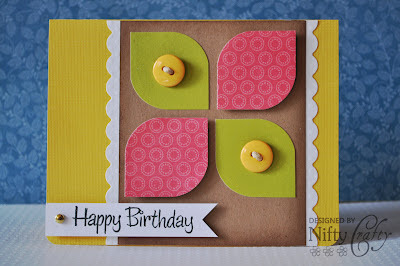 This will be an easy card to make in different colors and probably using different shapes too. For this card, I got four pieces of patterned paper that are 1½" x 1½" from my scrap pile and I used my corner rounder to round two of the corners of each pieces on the opposite sites. That's how I got the 'leaf' shapes. Then, I embellished the card with two cute yellow buttons on each of the green papers and finished it off with the 'Happy Birthday' sentiment along with a little gold brad. The final card measures 4¼" x 5½". I really love this color combo and want to make more cards using these colors. This is gorgeous, love the bright colours and the modern vibe! Congrats on your win at FMS. I really love your style!